It is located in Hikkaduwa, Sri Lanka. The basic principle of our Ayurveda Resort is Contentment and wellbeing can be achieved only through the harmony of body, spirit and soul. We offer Ayurvedic cures where this traditional holistic approach to health originates. For this, our highly qualified team of doctors and therapists are available at your convenience. Your cure will begin with a thorough examination and diagnosis. Based on the results, our doctors will prepare your individual treatment program according to your disorders and constitutional type. 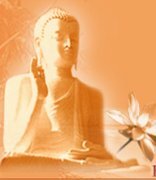 The following Ayurvedic treatments are available at Lawrence Hill Paradise Ayurvedic Centre: Panchakarma, anti-stress, rejuvenation, purification, weight-reduction program, and aroma-therapy. Special treatments are offered at no additional cost. You don’t need to decide on your type of cure at the time of booking. After the initial consultation, our doctors will discuss with you the recommended program and the individual therapies based on your ailments, the duration of your stay and your personal goals. At Lawrence Hill Paradise we offer more than 50 different treatments with Ayurvedic oils and medications prepared on our own premises. Of course we also offer long-term cures. We generally attempt to arrange your treatments in a continuous block either in the morning or afternoon, leaving you plenty of free time. You can go on short excursions, take walks, explore the surrounding area or simply relax on the acclaimed beaches of Hikkaduwa. Throughout your cure, our doctors will continuously monitor your therapies during regular examinations. If necessary, your treatment plan will be altered or extended. Our experienced therapists are here to ensure your well-being during your treatments. We do thorough initial examination by one of our Ayurvedic doctors. Natural remedies such as oils, powders, pills, capsules, tinctures, concoctions and pastes are prescribed three times daily. Daily therapeutical treatments which are a minimum of 2.5 to 3 hours duration will be performed by our trained therapists. An intensive care is demonstrated by our doctors and therapists throughout your entire cure. Your individual diet will be determined by our doctors based on your constitutional type. Each meal of Ayurvedic whole foods is lovingly prepared fresh by our experienced chefs. 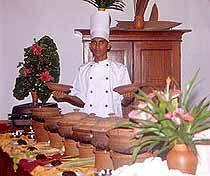 You will be amazed by the diversity of Ayurvedic cuisine! Please be reminded that we do not serve alcohol. Our lavishly spacious resort is under European management and reserved exclusively for our Ayurvedic guests. The hotel has 14 rooms, small enough to guarantee absolute individual treatment of each valued guest. The rooms are spread throughout our property, enabling you to get away and for complete peace of mind. After your treatments, enjoy our generous swimming-pool or relax and unwind under a shady palm tree within our spacious tropical garden. Each room is furnished with a king-sized bed, a private terrace or balcony, telephone, solar-heated water, ventilator and - if so desired - with air-conditioning. The beaches of Hikkaduwa are acclaimed to be among the best in Sri Lanka and are within a five minute walk from the hotel. The colorful coral-reefs with their marine life along the shores of Hikkaduwa are especially noteworthy. Start of Season Special Offers - From 25th July - 31st August 2009: Stay 14 Days and get a bonus of €150 & Stay 21 Days and get a bonus of €300. Rates from July 25 to August 31, 2009 - Per day including Ayurvedic full board and cure: Double room per person and cure-day - € 109.00 & Single room per cure-day - € 129.00. Accommodation with Ayurvedic full board, without treatments: Double room per person - € 46.00 & Single room - € 66.00. Rates from September 01 to October 31, 2009 - Per day including Ayurvedic full board and cure: Double room per person and cure-day - € 119.00 & Single room per cure-day - € 139.00. Accommodation with Ayurvedic full board, without treatments: Double room per person-€ 56.00 & Single room - € 76.00. Rates from November 01, 2009 to March 31, 2010 - Per day incl. Ayurvedic full board and cure: Double room per person and cure-day - € 134.00 & Single room per cure-day - € 149.00. 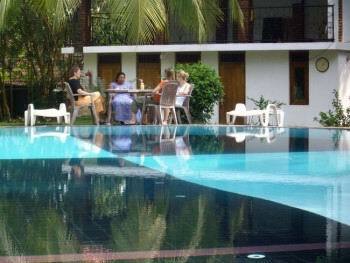 Accommodation with Ayurvedic full board, without treatments: Double room per person-€ 84.00 & Single room-€ 99.00. Ayurvedic cures and durations can be chosen individually. 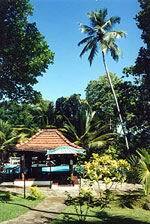 Prices quoted do not include flights to/from Sri Lanka. Airport-transfer (one way): € 99.00 & Shared transport two ways (subject to availability): € 49.00. Please note: Ayurvedic full board without treatments is possible for a maximum of three days before or after an Ayurvedic cure. And please note that we accept only guests who wish to take an Ayurvedic cure and the minimum cure-duration is seven days. We have created a separate room for the use of Internet. Our guests now have the possibility to use our notebook-computer or to connect their own to the World Wide Web. Our DSL-connection allows for a speedy service so that you can send your impressions of Sri Lanka, Hikkaduwa and Lawrence Hill Paradise to your loved ones at home. During summer break this year, we not only repaired our swimming pool, but also installed a completely new water processing-system. We are now using a technically advanced system for water-processing from Australia. This method completely eliminates the conventional use of chlorine, which often causes skin irritations and other problems. Our spacious accommodation is designed especially for your comfort and to suit Ayurvedic requirements. We offer Full-board with Ayurvedic whole food including herbal teas, water and prescribed juices. We provide homemade goodies for afternoon tea. We have an experienced guest relations manager. Yoga lessons by professional yoga-teachers twice daily. Individual yoga-lessons are also possible by arrangement. Daily consultations are possible if necessary or required. Medical staff available 24 hours. Address: 47 Waulagoda Hikkaduwa, Sri Lanka.